Beauties are found both south and north of the Ecuadorian capital, but on this occasion we will head up north, to the Colombian border, to visit one of its most impressive sites – the El Angel Ecological Reserve. It is place most certainly worth visiting if you want to get a true taste of the Ecuadorian Andes. It’s true that when people think of Ecuador, usually the Galapagos Islands are the first place that comes to mind. And it’s no surprise either: The Galapagos archipelago is indeed a place that must be visited at least once in your life (and, of course, a Galapagos expedition vessel is the right way to do it if you want to get the most out of your Galapagos experience). However, some less spoken-of areas of the country are as beautiful as the Galapagos and hold similar amazing landscapes. Sometimes, even the most incredulous travellers will be surprised. Though the Galapagos are known for the role they played in the development of Darwin’s Theory of Evolution, people often forget about Alexander Von Humboldt’s description of the highlands of Ecuador: the famous Avenue of the Volcanoes. It is the Ecuadorian Highlands – or Sierra in Spanish – that will take your breath away with their dynamic landscapes, lush greenness, smoking volcanoes, impressive snow-capped mountains and dramatic features. 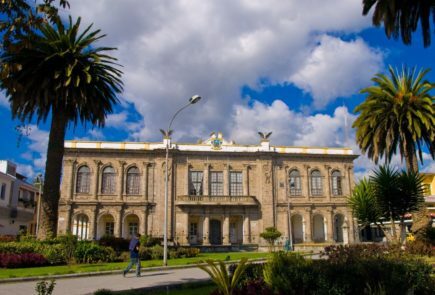 Staying an extra three or four nights in Quito, at the heart of its World Heritage colonial downtown, is the right way to go at it if you want to get deeper into the exploration of the highlands. Casa Gangotena, located at the heart of this historic old town, is the perfect base camp from which to get started. On your way up north, some of the highlands’ most iconic visitor cites will be on your way. Leave in the early morning if you wish to make some stops along the way. Some are right by the highway and can be visited with no delay, others require a little detour. You can organize these visits depending on the amount of time you have. When driving north you will go through the beautiful Imbabura province, home to the famous and colorful Otavalo handicraft market, a must-see if you happen to be visiting the sierra. Right before you get to the market you will get a glimpse of the amazing San Pablo Lake sitting at the slopes of impressive mount Imbabura. If you have a little more time on your hands, you can also take a detour to visit the small town of Cotacachi, known for its leather handicrafts and its beautiful Cuicocha Lake – a remnant of Cotacachi’s volcanic explosion that is home to two small islets and make for a spectacular view. After driving through Imbabura province you will arrive to the northernmost Ecuadorian province of Carchi. Located a two-hour drive away from Ibarra, Imbabura’s capital city. El Angel Ecological Reserve is a 15,715 hectare moor composed of 80% Andean woodlands and wetlands. It has high levels of rainfall and its cold highland-equatorial climate can reach temperatures as low as 5 ºC. The typical moor landscape is home to moor deer, Andean wolfs, rabbits, condors, Andean ducklings, badgers, and two-toed sloths, amongst others. Its harsh but amazingly beautiful landscape is dominated by the Espeletia tree, commonly known as frailejon, which belongs to a genus from the sunflower family. The frailejon is native to Colombia, Ecuador and Peru and is considered an endangered plant due to the deforestation of the moor for agricultural purposes. Its succulent and hairy leaves are very thick and protect the plant from the cold, while capturing water vapour from passing clouds. The water is stored in the plants trunk and later released into the soil through its roots, which is why the frailejon contributes to water sustainability. The highest frailejones in the Reserve can grow up to be 7 metres high which, along with the Park’s three beautiful lakes, make for an amazing out-of-this-world landscape. Have your camera ready, for you will surely be astounded by the alien-like scenery of this amazing Reserve!